From a seated position open the legs out diagonally. Remaining sideways stretch the side of the body by leaning down to one leg. If you are a beginner the posture can be performed quite easily. If you need a little support put the hand you see in the picture opposite down on the mat. You may want to stretch the arm out straight even if you are flexible enough to grab. It gives a different stretch and strengthens the shoulder muscles. Point the toes, heels or ball points of the toes. Extending energy through the heel of the leg you are leaning away from can really help bring the back of the leg down to the floor. It naturally lifts a little due to muscles in the hips and along the side of the torso. For this reason extending through the heel in this opposite leg is one of the better options. Look sideways or up. Rotating the spine and looking up will aid in the twist. The leg on the side you are stretching naturally turns out. It will allow out to twist more when it is open but you may want to straighten it to bring the fundamentals of Tadasana (The mountain pose) to the leg. There is lots of ways the arms can be configured. Mudras can be formed with the hands and the foot can be held in a number of different ways. 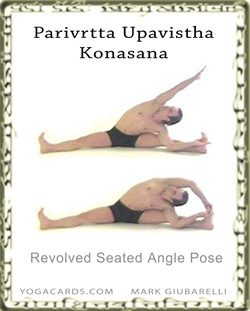 A nice time to blend these postures is before and after hip openers. Almost all students can enter this posture so it is a good choice for a side stretch.